F Karel Hromas (Everett, 2004-06) has signed a one-year extension with Morzine-Avoriaz-Les Gets (France, Ligue Magnus). He had 14 points, including six goals, in 22 games this season. . . .
F Michal Lukáč (Prince George, 2001-02) has signed a one-year-plus-option extension with Kladno (Czech Republic, 1.Liga). He had two goals and seven assists in 49 games this season. 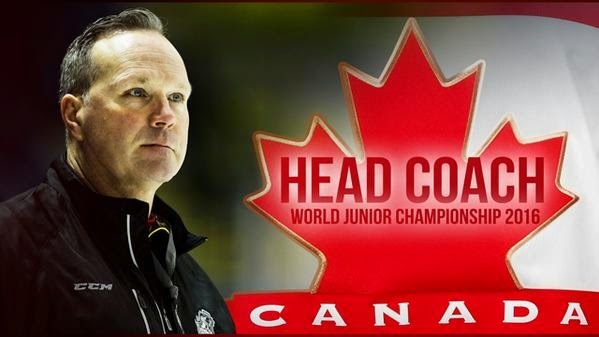 Dave Lowry, the head coach of the WHL’s Victoria Royals, has been named the head coach of Canada’s national junior team for the 2016 World Junior Championship. Hockey Canada made the announcement on Monday. Lowry, 50, was an assistant coach with the Canadian team that won gold at the 2015 WJC in Montreal and Toronto. Lowry is in his third season as the Royals’ head coach and is the reigning coach of the year. Lowry, who played 19 seasons in the NHL, was the head coach of the Calgary Hitmen in 2008-09. 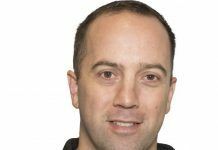 The national junior team’s assistant coaches are Dominique Ducharme, the head coach of the QMJHL’s Halifax Mooseheads; Martin Raymond, the head coach of the QMJHL’s Drummondville Voltigeurs; and D.J. Smith, the head coach of the OHL’s Oshawa Generals. The 2016 WJC is scheduled for Helsinki, Finland, from Dec. 26 through Jan. 5. It will be the 40th anniversary of the IIHF championship. 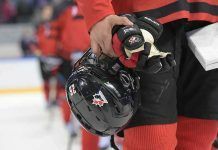 In preparation, Canada will play teams from Czech Republic and Russia in an exhibition tournament at some point this summer. Those games are expected to be played in Calgary. Kelly McCrimmon, the owner, general manager and head coach of the Brandon Wheat Kings, will serve as the head coach of the U-18 team that will represent Canada at the Ivan Hlinka Memorial tournament in August. Hockey Canada made the announcement on Monday. That announcement came two days after the Wheat Kings clinched the Scotty Munro Memorial Trophy with the regular season’s best record. This will be the 54-year-old McCrimmon’s first involvement with Hockey Canada’s Program of Excellence. He has been with the Wheat Kings since 1988; he was the head coach from 2004-11 and has been the head coach, again, for the past two seasons. The U-18 team’s assistant coaches are Sheldon Keefe, the head coach of the OHL’s Sault Ste. Marie Greyhounds, and Darren Rumble, the head coach of the QMJHL’s Moncton Wildcats. Canada has won gold at each of the last eight Ivan Hlinka Memorial tournaments. The tournament is held annually in August in Breclav, Czech Republic, and Piestany, Slovakia. Attendance in the WHL was up marginally in 2014-15 over the previous season. This season, 12 teams showed an increase, nine teams were down over the previous season and one team, the Medicine Hat Tigers, stayed the same. The Calgary Hitmen were the runaway leaders, averaging 8,462 fans per game, up 210 over last season. The Portland Winterhawks were No. 2, at 6,980, but that was down 349 from 2013-14. 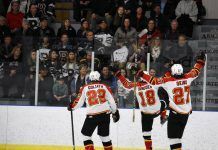 The Prince George Cougars showed the greatest increase, their average crowd of 2,852 this season an increase of 1,159 over the previous season. Keep in mind that the WHL’s attendance figures reveal the number of tickets sold and not actual per-game attendance. There is a terrific look at CHL attendance right here. The Medicine Hat Tigers will be without their captain, D Ty Lewington, when they open the playoffs against the visiting Red Deer Rebels on Saturday. Lewington drew a one-game suspension after incurring 32 minutes in penalties at 13:03 of the third period. He was hit with a instigating minor, two fighting majors, a misconduct and a game misconduct. . . .
Ch-ch-ching! Claude Noel, the head coach of the Vancouver Giants, was hit with a $500 fine for comments about officiating after a 4-3 OT loss to the visiting Kelowna Rockets on Friday. . . . If you haven’t seen those comments, they’re right here in a piece by Steve Ewen of the Vancouver Province. 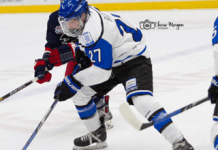 D Amil Krupic, 19, won’t be back with the Saskatoon Blades. 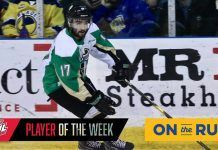 GM/head coach Bob Woods has confirmed that with Daniel Nugent-Bowman of the Saskatoon StarPhoenix. . . . Krupic, from Sweden, had 27 points, including five goals, in 69 games. . . . 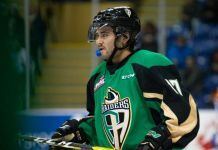 The Blades will be picking second in the 2015 CHL import draft on June 30. . . . Nugent-Bowman takes a look right here at the Blades’ season and where they’re headed. The Calgary Hitmen hope to have D Jake Bean, 16, back in their lineup when they open the playoffs against the visiting Kootenay Ice on Friday. Bean missed the last nine games of the regular season with a broken wrist. He had 39 points, including five goals, in 51 games. He now holds the franchise record for most points in a season by a freshman defenceman. Stephen Peat was as hard-nosed a defenceman as the WHL has seen during his time with the Red Deer Rebels, Tri-City Americans and Calgary Hitmen (1995-2000). After his WHL days, he went on to a pro career that took him to the NHL where he played 130 games with the Washington Capitals. His name is back in the news these days, but it has nothing to do with hockey. Langley, B.C., RCMP say he has been in custody since March 19, charged with one count of arson with a disregard for human life, and one count of arson causing damage to property. . . . There is more right here. Stat of the day:0 – Number of WHL players not named to win the WHL Player of the Month Award in the year 2015.